• visit the Youtube Channel: OSU Forage Systems and view the videos related to measuring forage availability. 3. After clicking it, you will be directed to the WSS opening screen. 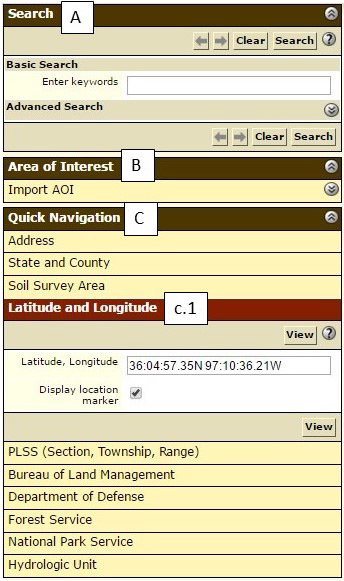 the site can be located by either “Search” (A), “Area of Interest” (B), or “Quick Navigation” (C). Click the arrows to display details of a specific choice. 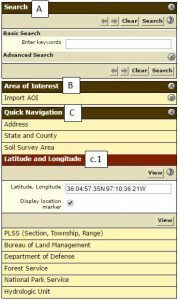 • Area of Interest (B): Insert shapefiles which were previously created on WSS or in any other software such as ArcGIS and Google Earth. • Quick Navigation (C): Search sites by different options as show in Figure 1. Figure 1. 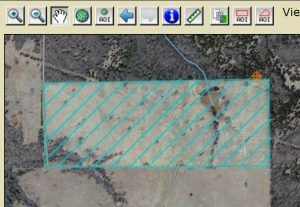 Area of interest locator panel. 1. Find your AOI in Google Earth, which contains updated imagery and a user-friendly interface. 2. Convert the Google Earth lat/long to one of the WSS acceptable formats. For example: Google Earth: 36°04’57.35’’ N, 97° 10’36.21’’ W converts to WSS acceptable format: 36:04:57.35N 97:10:36.21W. Click on help for checking all acceptable lat/long formats. 3. Click on to display the selected AOI in the “Area of Interest interactive Map,” depicted in Figure 2. Figure 2. Area of interest interactive map. After displaying the AOI on the map screen, mark the boundaries of your site using the Tools “AOI by Rectangle” (D) or “AOI by Polygon” (E). 1. Click on “AOI by polygon” (E) to activate it. 2. Place the cursor + at one of the AOI edges, mouse left click, move the cursor + to the next edge, and mouse left click again. Repeat this until the cursor reaches the last unclicked edge. Then, double left click on the last unclicked edge. 3. The AOI Area (F) will be created and displayed in blue after double-clicking. (Figure 3). It will display the “Soil Map” (G) of your AOI followed by the “Map unit Legend” (H) in the left column. By clicking any “Map Unit Name” (h.1), the “Report – Map Unit Description” for the selected map unit will pop up. 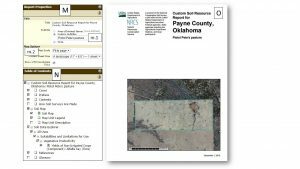 This description contains information such as mean precipitation, mean temperature, frost-free period, slope, soil profile and soil depth. Figure 3. 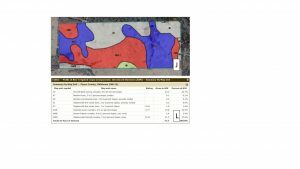 Soil map tab overview. Figure 4. Vegetative productivity ratings. 2. “Yields” (I) for introduced pastures in two water regimes “irrigated and non-irrigated”. 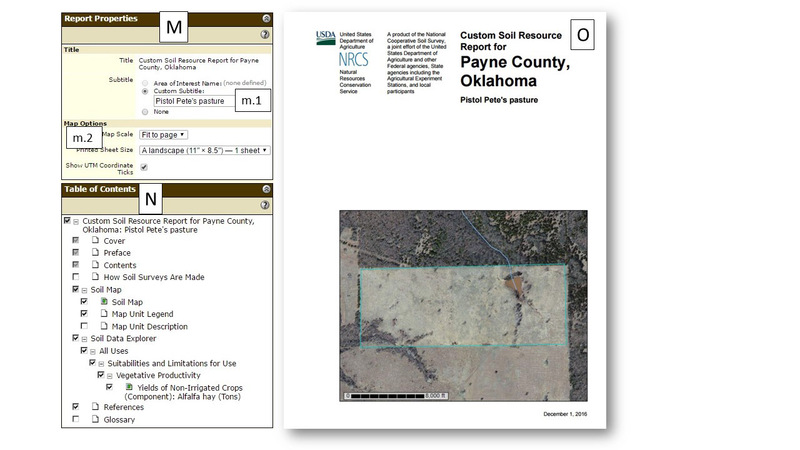 Both options have two versions: “component and map unit.” For Oklahoma, it is most likely that the information will be displayed in the “component” version. 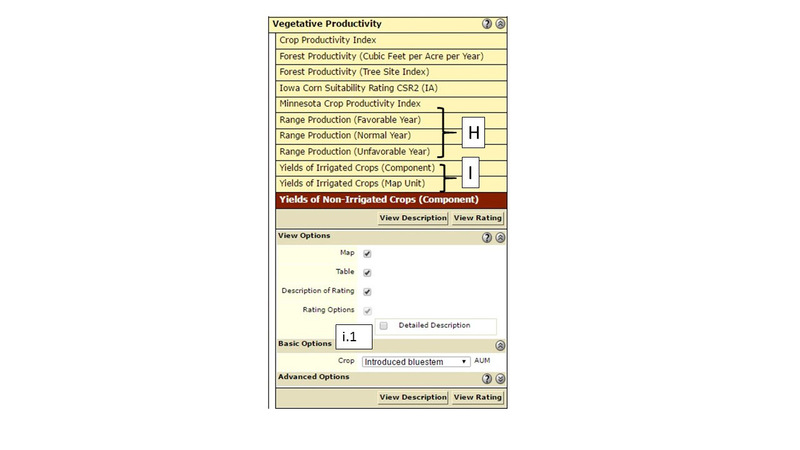 The “Yields” (I) contains different crop options which can be selected at the “Basic Options (i.1)” drop-down menu by clicking . The AOI depicted in the previous figure is a non-irrigated, introduced bluestem field; therefore, we selected the proper option for this case (Figure 4). After selecting your choice, click to display your option. For more detailed information on our specific choice click and/or . 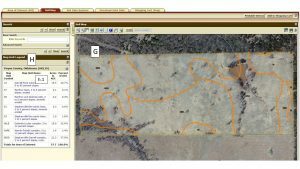 After processing, the Vegetative Productivity Map will be displayed. The production yield may vary and will be displayed within the results. The most common units are pounds per acre, tons per acre, or animal unit month (AUM). Following our example (Figure 5), the introduced bluestem productivity map (J) is shown, followed by the productivity table (L) where “Rating” is the amount of introduced bluestem in animal unit months (rule of thumb: 1 AUM = 780 lbs of forage). Figure 5. 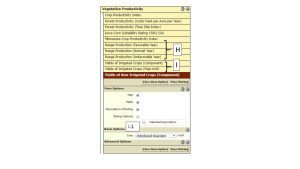 Vegetative productivity map and table. 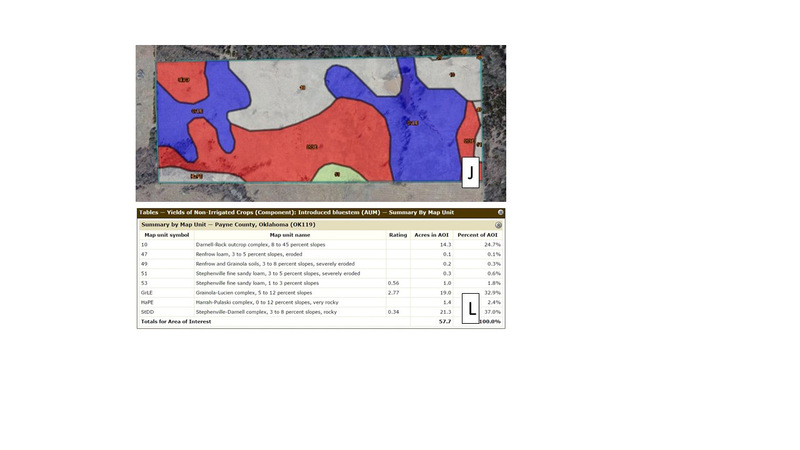 The forage productivity values retrieved from WSS as shown above can be used to preliminary calculations. For proper calculations, refer to PSS-2871 Stocking rate The Key to Successful Livestock Production at http://factsheets.okstate.edu/documents/pss-2871-stocking-rate-the-key-to-successful-livestock-production/ . Furthermore, keep in mind, that all productivity displayed by WSS is the potential productivity, assuming a high level of management. It is recommended to take notes of the description that follows every table. This contains information that describes the limitations of the estimated yield values. sub-tab contains information such as soil pH, electrical conductivity (proxy for soil salinity), soil erosion factors, potential soil available water to plants, soil texture, soil bulk density (proxy for soil compaction), etc. Those data are important when selecting for proper forage selection and management. Furthermore, the sub-tab contains information regarding native species composition or the native plant species that can be determined for the selected AOI, assuming AOI that is kept native. For any data retrieved by pressing , regardless of the tab/sub-tab, you can add that data to your final report by clicking located at the upper right corner of the active tab. Then, click in the tab . The “Report Properties” (M) and “Table of Contents” (N) will be displayed in the left column (Figure 6). If desired, customize your sub-title (m.1), map size (m.2), and table of contents. Then, click on located at the upper corner of the current tab, select “Get Now” from the “Delivery Options” window, and hit “OK.” The report will pop up in a new tab of your internet browser. Figure 6. Report Download Options panel and Final Report. Keep in mind, the final report is very useful for preliminary planning. However, on-site assessments and measurements are essential for an accurate forage estimation.